The construction of the Berlin Wall triggered a volatile and tempestuous situation both in East and West Germany as well as around the world. 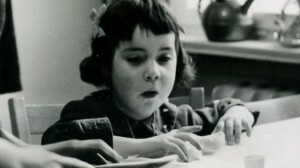 In such a situation, THE FORGETTING GAME tells the story of Beate Kernke, a 5-year-old East German girl who became the first person to be legally and peacefully transferred across the Wall in March 1963, after intense negotiations between the Red Cross and the East German government. This event was then erased from historical record as soon as it happened. Escorted by American Red Cross field director Neil Clark, Beate made her way from her grandparents’ home where she has been living for over two years to Clark’s home in West Berlin where she stayed for a short while. During this time, she developed a close bond with the Clarks, especially their daughter Pam, with whom she developed an unlikely friendship that crossed language and cultural barriers. Soon after, however, Beate was relocated to the U.S. where she was reunited with her mother and stepfather. Beate and Pam never saw each other again. Beate thus became a beacon of hope and compromise amid the violence and mistrust that pervaded the Cold War era. THE FORGETTING GAME is a deeply personal yet highly poignant documentary that reminds us of the nuanced power struggles that surround every terrible situation, the media outlets that cover those stories, and the families that are caught in the middle. Most importantly, it tells the personal story of two families whose paths crossed intimately 48 years ago and have not crossed again since. THE FORGETTING GAME tells a story that has never been told, a story that transcends generations, and asks us to question the very ways in which history is written.